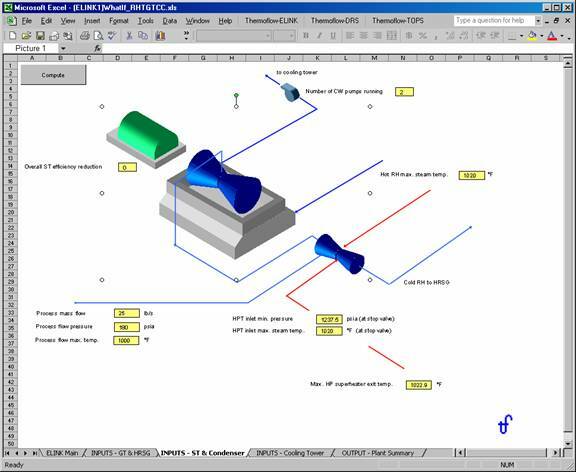 Thermoflow’s world-renowned software is used by thousands of power plant engineers at hundreds of companies around the world. Whether they are designing new plants, repowering old facilities, or analyzing how to best operate their fleet of power plants, engineers are using Thermoflow software to do the job. If you own or operate one or more power plants, we, or any of our value added resellers, can quickly provide you with a fully-predictive, turnkey plant model so you can start improving your plant operations today. The packaged model comes in our WISEbook (What-if Simulator in an Excel Workbook). 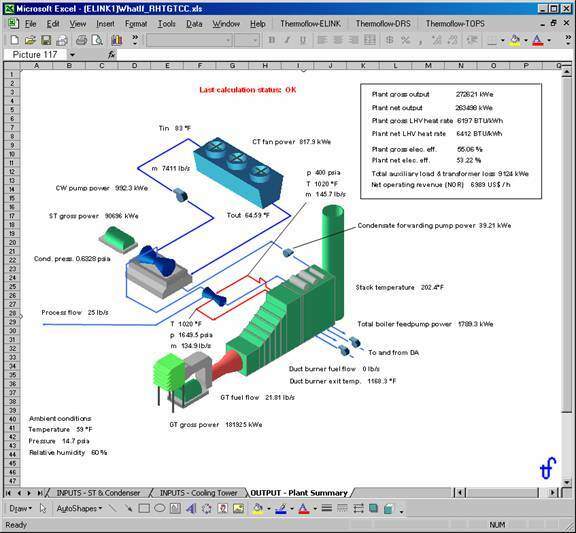 The WISEbook is an Excel workbook that can run Thermoflow’s powerful simulation software behind the scenes. If you can use Excel, then you can use a WISEbook; no modeling experience is necessary. However, this does not mean the model is simple, or lacks features. On the contrary, under the hood is the full hardware based modeling software that has been in continuous development and use since 1987 for modeling gas turbine combined cycles, cogeneration (combined heat and power) plants, convention steam power plants, district heating plants, steam facilities, reciprocating engine power plants, and chilled water facilities. Contact Thermoflow for more information, or a reference to a Value Added Reseller in your area. This sample shows a turnkey model of a 1-on-1 gas turbine combined cycle. Inputs are spread across three worksheets of the Excel workbook, one for GT & HRSG, another for ST & Condenser, and the third for the Cooling Tower. Model inputs are the yellow boxes, which all have a default starting value. You start the computation by pressing the button in the top left-hand corner of any input screen. Following computation, the output screen is automatically updated with the results. GT & HRSG Input Screen – Enter data in yellow input boxes. Among other, here, you enter site conditions that play a major role in determining gas turbine capacity. Press Compute button to start computation with takes from 5 to 20 seconds on a current PC. 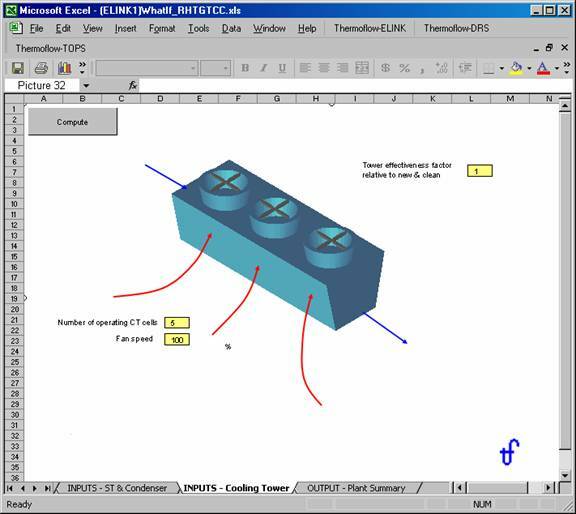 ST & Condenser Input Screen – Enter data in yellow input boxes. This plant sends process steam taken from intermediate turbine exit port over the fence. Cooling Tower Input Screen – Enter data in yellow input boxes. Press Compute button to start computation with takes from 5 to 20 seconds on a current PC. 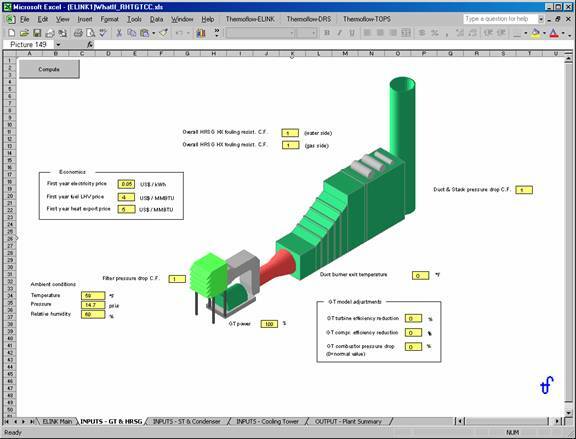 Plant Summary Output Screen – Overall technical and economic summary shown in the box at top right. Detailed component results shown near each graphic. Any number of customized output displays can be included. Tabular and graphical reports can be easily integrated to provide the most effective tool for your needs.